Eight Holland Street is the new gallery space from designer Tobias Vernon and curator Rowena Morgan-Cox. The gallery showcases carefully selected twentieth-century British artwork, European vintage furniture and studio pottery, Scandinavian and Moroccan textiles, objects from across the globe, contemporary design and inspirational reference books. Our two-storey space in an eighteenth-century terrace in the historical streets between Notting Hill and High Street Kensington is a space to wander around, sit and discover. The gallery will host regular exhibitions, talks and special events. For information on hiring the space please call us on +44 (0) 20 7430 0150. As well as our ever-changing inventory on sale in the gallery, the team also offer bespoke services in art buying, furniture sourcing, and interior design consultancy. We offer clients advice on building and styling their collections and homes. We believe our living spaces should reflect who we are, and should be decorated with passion and confidence. Tobias Vernon honed his colourful and eclectic aesthetic as an interior designer and art buyer, with private clients all over the world. He began his career working at Caroline Paterson Interiors and as a design consultant to Virginia Howard Limited. Before that studied History of Art at Trinity College, Cambridge and later, Business Management at the Judge Business School. Tobias was first introduced to British abstract painting in Cornwall and juxtaposes this understated aesthetic with European modern design found on trips to Italy and France. Rowena Morgan-Cox is a specialist in nineteenth- and twentieth-century British art and design. A former director of The Fine Art Society, Rowena managed, among other projects, the sale of the John Scott collection of decorative arts and sculpture and curated several exhibitions including Modern British Sculpture, Gerald Laing: A Retrospective and an annual British Design show. After studying for an MA at the Courtauld Institute of Art, Rowena started her career in the art world at Agnew’s. Rowena has given numerous talks and lectures and is the youngest committee member of the Decorative Arts Society. After studying Interior Architecture at University of Westminster, Naomi began her career sourcing and styling props for interiors photo shoots for editorial and commercial clients. Most recently she worked in the design team at the prestigious textile studio, Vanderhurd, working on bespoke interiors projects for clients such as Firmdale, Harding & Read and Suzy Hoodless. 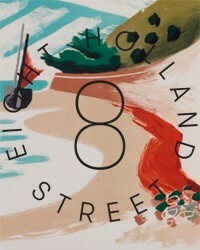 She has brought her keen eye for contemporary design to the Eight Holland Street mix.